The "alpha" version means that this is a test release with still incomplete set of features. Please read a notice about future plans. PC with a 233 Mhz CPU or faster (see the troubleshooting section if you have too slow PC). Winamp player v3.0 or later. The Winamp player can be downloaded for free at www.winamp.com . Please notice that this version of PaceMaker isn't compatible with Winamp v2.x player; there's however another version of PaceMaker for Winamp v2.x that's available at the PaceMaker home page. To enable PaceMaker, click the "PM" icon on Winamp3 "Thinger" window (see picture beside). The PaceMaker window should now appear on your desktop. If the "Thinger" window isn't visible, click the Nullsoft logo at corner of the Winamp3 window to show the Thinger. 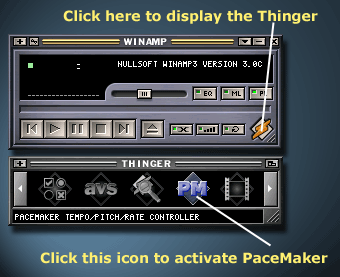 To close the PaceMaker window, either click the close icon at corner of the PaceMaker window title bar or click again the "PM" icon on Winamp Thinger. To permanently uninstall PaceMaker from your computer, locate the file "pacemaker.wac" at your \Program Files\Winamp3\Wacs directory and delete it. Control the Tempo, Pitch & Playback Rate settings by moving the sliders or pushing the -/+ buttons at the right-hand side of the sliders. Adjustment ranges are currently -50%..+100% for Tempo & Playback Rate and -12 .. +12 half-steps for Pitch (i.e. semitones, 1/12th of an octave). Pushing the "Disable" or "Enable button will temporarily disable/enable PaceMaker sound tweaking effects. Pushing the "Reset" button resets the controls to zero settings. Pushing the "Help" button displays help file (this page). The sliders can be fine-adjusted with the mouse wheel or keyboard, just activate the desired slider first by clicking it (or its label) with a mouse button or use the 'tab' key to switch between the sliders. The currently active slider is indicated with green color. The Mouse wheel adjusts the active slider in small steps. The arrow keys on the keyboard adjust the active slider in small steps. The Page Up/Down keys adjust the active slider in larger steps. The Home key resets the current slider to center position. Winamp3 cross-fader causes a delay of several seconds. To eliminate this delay, disable the cross-fading by clicking the button with an 'X' symbol on Winamp3 main window. Winamp buffers sound data for a couple of seconds to prevent skips under heavy system load. If you find the delay annoying, go to Winamp3 preferences and reduce the 'Buffer Size' setting in audio/DirectSound configuration page. Is there an expiration time limit in PaceMaker3? No, this version doesn't have a time limit. There was an expiration date in the first alpha release of PaceMaker3, but it was removed because it's likely that this is also the last version of PaceMaker3 component for Winamp3 for the time being due to suspending of Winamp3 player development work by Nullsoft. PaceMaker doesn't work with audio CD's played in my CD-ROM station. PaceMaker processes the sound data that Winamp3 passes through it. If PaceMaker doesn't affect your audio CD's, ensure that "Enable CD audio extraction" is checked in "Audio CD Settings" page of Winamp preferences. If this doesn't help, it may also be that your CD-ROM drive can't extract audio data in binary format. Winamp3 requires quite a lot more CPU muscles than the good old Winamp2. If you have an older PC with say 150..300Mhz processor, you might be better off with the older Winamp version. You'll find Winamp 2.81 at classic.winamp.com and PaceMaker for that version at the PaceMaker page. Yes it is; Please contact the author if you'd wish to receive the source codes or otherwise have more information. Please notice that I've released an open-source library having similar DSP routines than PaceMaker that can be used for doing sound processing in own applications. See the SoundTouch page for source codes and more details. Notice concerning Winamp3 future: Nullsoft (the group developing Winamp) has obviously suspended Winamp3 development project. Unless Winamp3 development will be resumed, it's infeasible to continue developing PaceMaker component for a dying player platform, and in this light this will be the last PaceMaker component release for Winamp3 player for the time being. Future work among PaceMaker will concentrate around Winamp2 or some other actively developed player platform. The PaceMaker is provided "as is" without any external support or warranty. This software can be used and further distributed for non-commercial purposes. When distributing the software, all files in the original installation package have to be included and kept unchanged. The software can be distributed as a part of a program collection or a publication, as far as no other payment is demanded except for reasonable delivery costs. The author won't take any responsibility for mental or social problems the software may cause. Check for updates at the product home page http://www.surina.net/pacemaker. The author can be contacted at <oparviai @ iki.fi>. When reporting bugs or missing features, please notice the above comment about the Winamp3 player future.